Matt McClain-Pool/Getty ImagesJudge Brett Kavanaugh. Democrats on the Senate Judiciary Committee accused their Republican counterparts of disclosing confidential information about Judge Brett Kavanaugh’s previous FBI background checks. In a letter to committee chair Chuck Grassley published Wednesday, Democrats took issue with two messages that committee Republicans posted on Twitter in defence of Kavanaugh. One of those tweets indicated the FBI found no evidence Kavanaugh engaged in inappropriate sexual behaviour, or alcohol abuse. The Democrats’ claim comes as the Supreme Court nominee faces new scrutiny over his drinking habits during his time in high school and college – and multiple reports of sexual misconduct from several women. Republican lawmakers shot back at the allegation and denied that it had mischaracterized the FBI’s background check. Democrats rebuked the committee’s tweets on the confidential background investigation and urged for a prompt correction. But by disclosing which tweets the Republicans allegedly erred on, Democrats appeared to suggest – without saying so explicitly – that the FBI’s previous investigations on Kavanaugh did indeed contain information about inappropriate sexual behaviour or alcohol abuse. 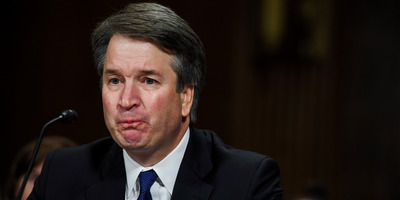 “It is troubling that the Committee Majority has characterised information from Judge Kavanaugh’s confidential background investigation on Twitter, as that information is confidential and not subject to public release,” Democratic lawmakers said in a statement to the chairman of the committee, Sen. Chuck Grassley of Iowa. “While we are limited in what we can say about this background investigation in a public setting, we are compelled to state for the record that there is information in the second post that is not accurate,” the statement added. “If the Committee Majority is going to violate that confidentiality and characterise this background investigation publicly, you must at least be honest about it,” Democrats said. Republican lawmakers shot back at the statement and denied that it had mischaracterized the FBI’s background check. The FBI conducted a supplemental background check, limited in terms of time and scope, on Kavanaugh after being prompted by the White House last week. Both Kavanaugh and his sexual assault accuser, Dr. Christine Blasey Ford, testified before the committee.